Sony Xperia XZ Premium and Xperia XZs Will Be Launched With World’s First “Motion Eye” Camera: Sony is reportedly planning to launch World’s First Memory Embedded Camera in its high-end upcoming Sony Xperia devices of 2017. The revelation came from an inside picture leak. The image also highlights the latest camera feature called “Motion Eye”. 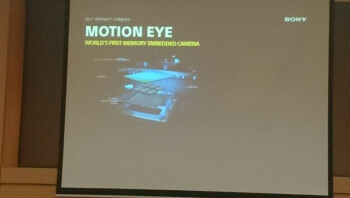 Both Motion Eye and dedicated memory module of the camera will work together to provide high-quality pictures. What we know about Motion Eye is that it captures images in a predictive sense. Using this feature Xperia will capture 4 pictures in the one second before you press the shutter button by automatically detecting the motion. This feature resembles with the Live Photos feature of the iPhones which allows it to snap images before you hit the snap button and after you hit it generating a nice moving picture. The same type of feature is provided on Galaxy S7 by Samsung and dubbed it as Samsung Motion Photo. Few days back we heard about the triple-layer CMOS image sensor on which Sony was working, had a DRAM. It looks like Sony is going to use the same chip in upcoming Xperia series models. One of the biggest advantage or merits of the camera with dedicated memory is the shooting pictures at super slow motion of 960fps. We can expect Motion Eye and Memory Embedded Camera featured in its two upcoming high-end smartphones allegedly dubbed as Sony Xperia XZs and Xperia XZ Premium. In other main specs, they are expected to come with 4k HDR display and a Qualcomm Snapdragon 835 SoC. There are no big changes expected from the design point of view as compared to the Sony handsets launched in 2016. Sony is hosting the MWC 2017 event on February 27 and hoped to announce multiple smart devices, but you should not expect them to launch Sony Xperia XZ Premium and Xperia XZs at this event as they are predicted to hit shelves after May.